St Augustine, Florida is the closest thing to an authentic history lesson in the entire state; maybe even the entire country. You will be walking among ancient functioning buildings, some of them dating back to the Ancient City's founding in 1565. 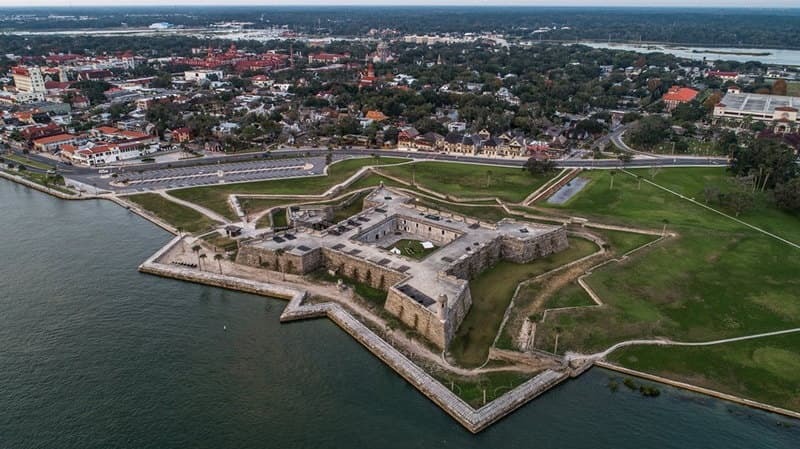 Many of the ancient buildings and forts that were a major part of St Augustine, Florida history are still in daily use by residents and visitors alike. This history of the city still lives and breathes and you can almost feel the ancient Spaniards keeping a benevolent eye on you. The history of St Augustine, Florida can be traced back to 1493. Juan Ponce de Leon was a shipmate of Christopher Colombus on his second voyage to the New World. He came back to Florida with his own expedition in 1513, and claimed the land - most of North America - for Spain. He named it "Florida the Great Country of North America." The French also tried to claim this land, but failed. Pedro Menendez de Aviles came to the area in 1565 from Spain with all the materials and people to establish a city. 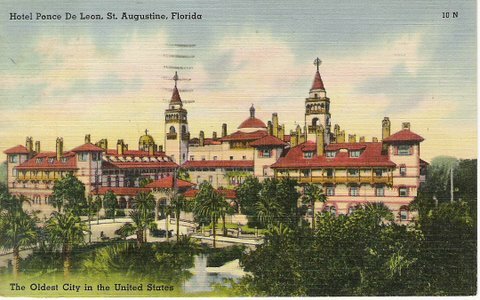 The official history of St Augustine began with its founding on September 8, 1565. One hundred years later, English pirates killed most of St. Augustine's residents. After that massacre, the Spanish built the Castillo de San Marcos. St Augustine Florida history includes a role in the American Revolutionary War. The Ancient City became an important British military center and supply depot. St Augustine has survived under the Spanish, British, American and Confederate flags. It was a Union town after 1862 until the end of the Civil War. 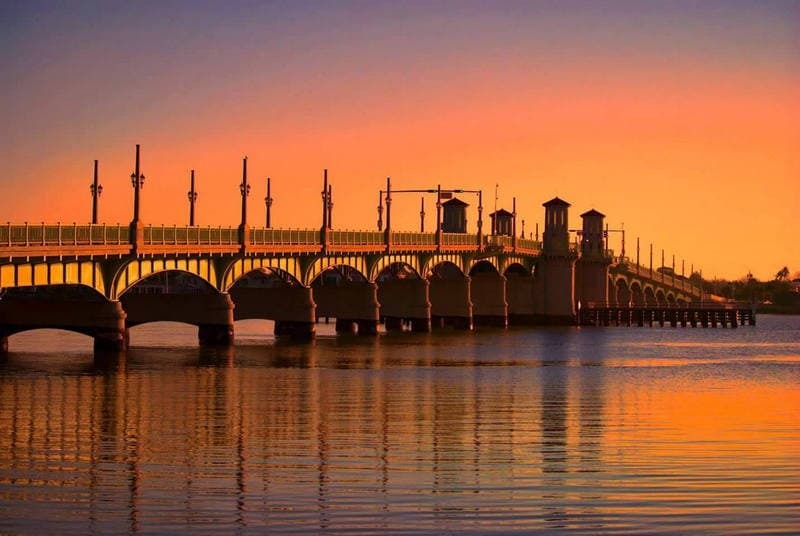 The modern history of St Augustine Florida began in the mid 1880's when Henry Flagler came to town. He built the Hotel Ponce de Leon and the Hotel Alacazar. St. Augustine became the base for Flagler's Florida East Coast Railway. This railroad expanded down Florida's east coast and had more to do with developing and populating the state than anything else. Some of the earliest settlers in modern St Augustine were Minorcans. They had been brought from Minorca to New Smyrna Beach in 1768 by Dr. Andrew Turnbull, a Scottish physician. Minorca and Majorca are the Balearic Islands located in the Mediterranean Sea. They belong to Spain. Dr. Turnbull thought these hardy people would be able to withstand the brutal Florida climate and conditions. His idea was to form a colony and develop a plantation. Life was miserable among the alligators, snakes and mosquitoes in the mangrove swamps around New Smyrna. The colonists were very unhappy, and more than 900 of the 1400 died during the ten years of the New Smyrna venture. The distraught colonists began to hear about St Augustine, and many of them decided to move up there. During May and June of 1777 most of the colonists migrated to St Augustine and by 17 July 1777 Turnbull's attorneys had set all the colonists free. Many of the descendants of these early Minorcan colonists still live in the St. Augustine area. Some of the family names that you will see in the phone book and on local businesses include Acosta, Manucy, Pellicer, Pacetti, Ponce and Canova. Other than the Seminoles, the Minorcans are probably the most senior of all ethnic groups in St Augustine Florida history. 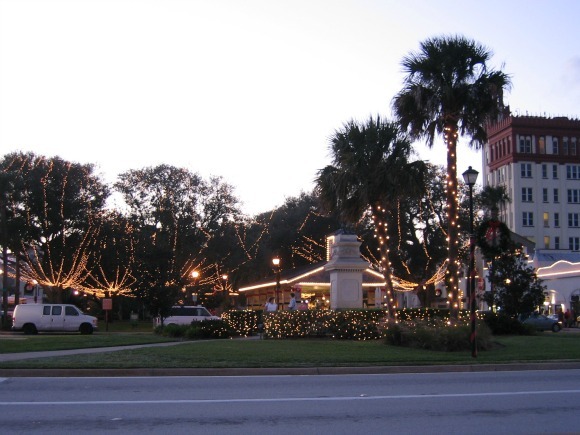 In the years after the Civil War, and through the development sparked by Henry Flagler, St Augustine remained in many ways a typical small southern town. The 1960's saw serious civil rights demonstrations in the Ancient City. Martin Luther King and other civil rights leaders of the time were in town during some stressful times. Since the late 1960's, St Augustine has seen a lot of development north, south and west of town, especially in the beach area. None of this development has spoiled the special charm of the downtown area of this special old city. Original 450 year old buildings made of coquina still stand and are functional. The Castillo de San Marcos is still impressive, in good condition, and is a major tourist attraction. St George Street remains a great place for people watching and breathing in the ambiance of the old buildings and costumed characters. The Ancient City is still charming in spite of the intense tackiness of some of its tourist attractions. St Augustine Fla is a great place to visit, and is a great place to live. There are hundreds, and here are a few I know about. Villa Victor Hotel, 42 San Marco Avenue, St Augustine, FL 32084. Tel: 904-829-2292. Totally renovated hotel in the heart of downtown. Reasonable prices and walking distance to everything. Conch House Marina Resort, 57 Comares Ave, St Augustine Fla 32080. Tel: 904-829-8646. 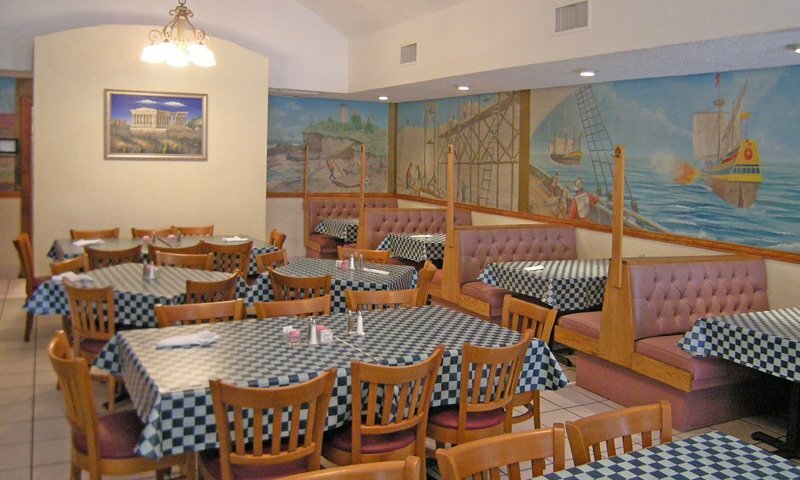 A nice older place with interesting dining rooms located on ship-like crows nests with great views overlooking Salt Run. The first time I stayed here the owner was Jimmy Ponce, who said he was a direct descendant of Juan Ponce de Leon. Casa Monica Hotel, 95 Cordova St, St Augustine Fla 32084. Tel: 904-827-1888. An elegant older hotel, beautifully maintained with fine dining. In the heart of the ancient downtown area, across from Flagler College which used to be the Ponce de Leon Hotel. The vintage colored postcard above is from the State Archives of Florida. You will still recognize these buildings as you walk down the street today. 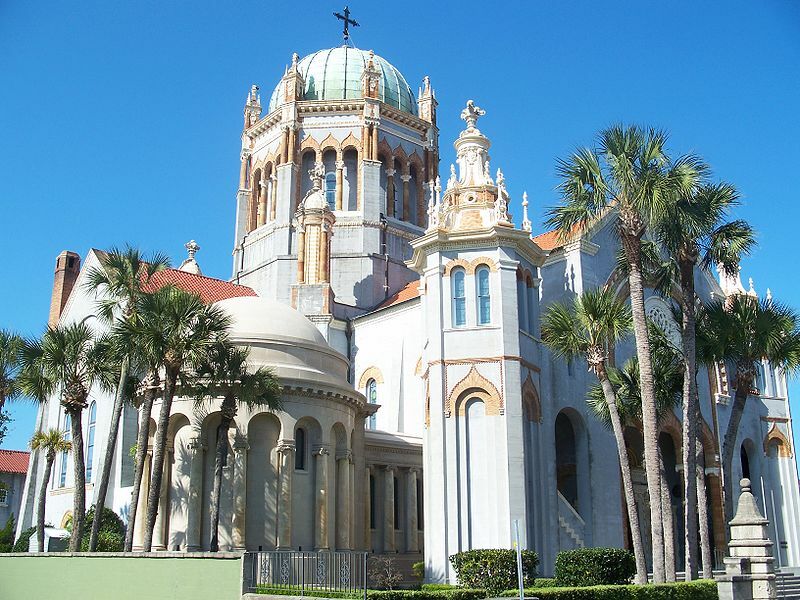 St. Augustine itself is actually the major attraction. Walk down St. George Street, wander through the fort, explore the back streets and alleys. The entire place is fun to be in. Among the many attractions in town, I like these the best. Alligator Farm & Zoo. On the National Register of Historic Places, you will enjoy the many shows featuring gators, birds, snakes and just about any other animal you can think of. Ripley's Believe It Or Not. This place continues to fascinate adults and kids alike. It is in an old hotel once owned by author Marjorie Kinnan Rawlings and her husband, Norton Baskin. Fountain of Youth. A visit to this place and a dip of its magic water will keep you young forever. Well, at least that's what old Ponce de Leon himself believed. Castillo de San Marcos. This old fort has a magnificent view of Matanzas Bay, and is still a formidable structure. Open to the public. Horse Drawn Tours. These great old horses and their loving masters are an Ancient City tradition. They take you on tours and show you things you wouldn't see on your own. Nights of Lights. This usually begins the Saturday before Thanksgiving and continues through the end of January. The entire town from ground to rooftops is lit up with millions of Christmas lights. National Geographic voted it one of the ten best holiday lighting displays in the world. St. Augustine Lighthouse offers tours and the view from the top is magnificent. 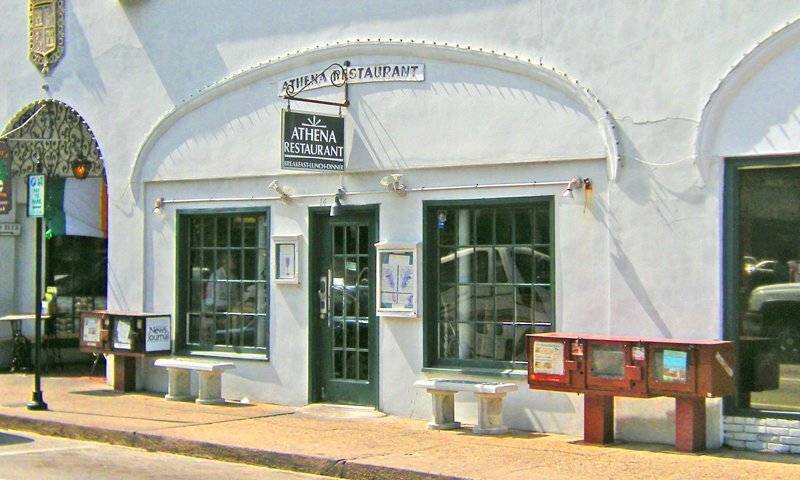 Athena Restaurant is a nice little Greek cafe right in the heart of downtown St. Augustine across the street from the Old Slave Market. I've been eating there for years and have never been disappointed. It has been owned for years by the Chryssaidis family. There is nothing fancy about the interior of this restaurant. It is clean but simple, and will remind you of a typical country restaurant or family diner. Once you are inside it's hard to remember you are right in the middle of a historic downtown district loaded with tourist attractions. For example, the oldest Catholic church in Florida, the Cathedral Basilica of St. Augustine, is on the same block as this restaurant. It's a great place for breakfast, lunch and dinner is you plan a long sightseeing day in the Ancient City. I love Greek food, and Athena has some good stuff. They have all of the standards like grape leaves, spinach pie, Greek salad and avgolemono soup with a nice lemony taste. They also have kebobs featuring chicken, lamb, beef or shrimp. Their pita bread is great. They also have the traditional saganaki, a flaming dish of cheese, with the traditional "opa" being shouted as the server ignites the plate and scares the hell out of granny who wasn't paying much attention. For folks with a more typical American palate, Athena also has good steaks and seafood. Tasty desserts include baklava and rice pudding. Athena is open 7 days a week for breakfast, lunch and dinner, and it's my preferred spot in the Ancient City for breakfast. My favorite here is just a simple breakfast of scrambled eggs, corned beef hash and whole wheat toast. They also have great waffles, good coffee and the prices are very reasonable. 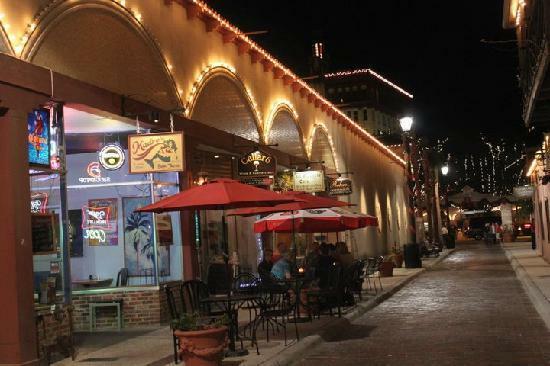 Although Cellar 6 is right in the middle of downtown St. Augustine, it has the advantage of being one block south of the main drag on quiet little Aviles Street. Not many cars rumble down cobble stoned Aviles, so it's a nice place to dine and drink outside and not have to breathe in exhaust fumes or have your quiet time disturbed by rolling boom boxes. This charming little place is pretty new - especially by St. Augustine standards - having opened in 2009. It is a perfect example of how the Ancient City is always improving and updating itself while remaining firmly planted in our historic past. Although it is new it already enjoys very favorable reviews from Yelp, TripAdvisor and other visitor driven review sites. Cellar 6 has a full service bar, a lot of comfortable couch seating inside and umbrella shaded bistro tables outside. The establishment features a tapas style menu. Tapas (sounds like "top us") originated as an idea in the Spanish culture, so it's perfect for St. Augustine. Tapas are appetizer sized, and can be cold or warm. You can add them up and have a full meal. Lots of olives and cheese are usually served also. Some of their specialities are ahi tuna, crab cakes, bruschetta, quesadilla and various other cheese boards and tasty treats. You can also get great pizzas and hamburgers. Cellar 6 boasts a wine cellar of 100 different wines and also serves 35 different beers from all over the world. Their desserts - cakes and pies - are delicious. I love fish tacos since first having them years ago at one of my favorite places in Coral Gables. Cellar 6 uses blackened mahi mahi in their tacos, and they are delicious. Cellar 6 is open 7 days a week. It opens at 5pm on Monday through Friday, and opens for lunch also at noon on Saturday and Sunday. They usually have various local musicians performing during the hours they are open. Gypsy Cab Company is one of my St. Augustine favorites. I try to visit St. Augustine two or three times a year, and when I do I always have dinner at least once at this great restaurant. This neat little place is near the historic St. Augustine Lighthouse. Gypsy is open for lunch and dinner 7 days a week, and brunch on Sunday from 1030am to 300pm. Gypsy has been around now since 1983, and in a city known for its restaurants, it is still one of the best. The food is great. Their menu has influences from Italian, German, Cajun, Mediterranean, classical European, Southern, Oriental, and "Floribbean". Their Italian dishes include linguini with red or white clam sauce; baked ziti; veal pesada and Italian sausage saute. They change their menu daily. I am not a big fan of Italian food - other than pizza - but my friends who do love Italian food have never been disappointed here. My favorites lean toward seafood, and here is where I think Gypsy really shines. I have had and can recommend their blackened catch of the day (quite often mahi mahi);their scallops and salmon provencal; and their seafood fra diablo. They also have a wide selection of soups, salads and appetizers. One of my favorite appetizers is blackened shrimp nachos. Although I am not a dessert person, I sometimes cheat and have one of the great ones at Gypsy Cab Company. Don't tell my doctor, but I really like their peanut butter pie. Prices are reasonable at Gypsy, especially when compared to some of the more upscale restaurants in St. Augustine. They have a full liquor bar and a good selection of beer and wine. The atomosphere and furnishings at Gypsy are casual, sort of middle of the ground. You'd be comfortable with shorts and a polo shirt or even a sport coat. Nobody will look twice at you. You will get a good feeling the minute you walk in the door. 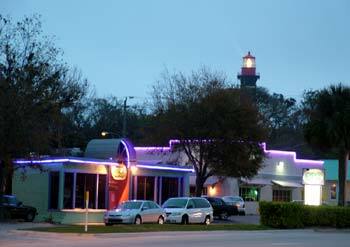 In 2000, Gypsy opened the "The Gypsy Bar and Grill" next door to the restaurant. It is a place for private parties, and also features "The Comedy Club" on Thursday, Friday and Saturday nights. St Augustine Florida is in Northeast Florida about 40 miles south of Jacksonville. I-95 and US-1 both go through the Ancient City, although I-95 is way out west of downtown. State Road A1A also goes to St. Augustine from Jacksonville Beach. St Augustine Florida is about 2 hours by car from Walt Disney World taking I-4.